Search for the best flight prices from Stansted to Valencia. Compare prices, book today and save money with Stansted Airport. 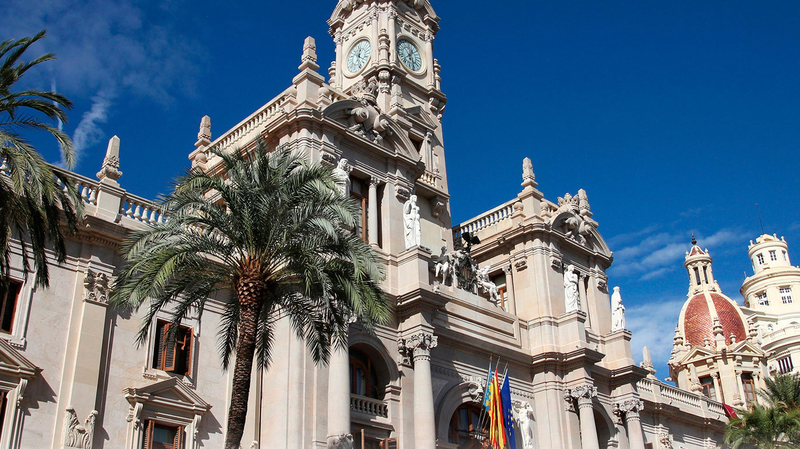 As Spain’s third largest city, Valencia is hotly chasing its siblings in terms of culture, style and innovation. A particular draw of Valencia is the futuristic skyline created by the amazingly designed buildings, but be sure not to miss out on the stunning selection of shopping and eating opportunities around the city. Modern shopping or quirky one-offs can all be found in Valencia, which is a great city for a dose of retail therapy, and great for shoes, leather goods and clothing, in addition to fresh produce. Head to the Mercado de Colón (Jorge Juan), a covered marketplace that offers a selection of upmarket flower and souvenir stalls, along with cafés and restaurants. For olive oil, cheese and other Valencian delicacies pay a visit to the bustling Central Market, while the city’s main shopping street, La Calle Colón, throws up choices such as Mango, Zara and El Corte Inglés. Valencia is not short of lavish hotels, such as the five-star Caro Hotel (Almirante 14). Francesc Rifé designed the elegant rooms, housed within a stunning 19th-century palace that sits in central Valenica. There are plenty of guesthouses that are more moderately priced, including the Hospedería del Pilar (Plaza del Mercado 19, which lies in the heart of the old city. For a mid-range option that boasts a rooftop pool and sweeping views of the old city centre, consider the Expo Hotel Valencia (Avenida Pío XII 4). There’s plenty of choice when it comes to dining in Valencia, with a plethora of restaurants, cafés and tapas bars to keep you fed and watered. Known as the birthplace of paella, rice dishes are hugely popular, although there’s many other specialities besides to keep you interested. Remember though that dinner is usually a late affair, with anything before 9pm considered an early start. Head to La Pepica (Paseo Neptuno 2, 6 and 8) for some beachside paella at a venue that has been running for centuries, and can count the likes of Ernest Hemingway among its former patrons, while Mercatbar (Calle Joaquín Costa 27) is an excellent option for tasty tapas. An early evening parade marks Epiphany for the children of Valencia, as a huge cavalcade of floats helps the three kings parade the city streets as sweets are thrown out to the excited gatherers. Las Fallas, or ‘the fires’, is a huge event in Valencia, and combines fiestas, fireworks and fires with large-scale papier mâché figures usually of contemporary personalities that appear on street corners all across the city. Valencia’s brass bands provide the soundtrack as figurines are carried through the city in celebration of Holy Week. Head to the seaside for the best experiences, while the most famous events are the Gathering of the Palms, the Procession of Placing in the Tomb and the Resurrection Cavalcade. There are two processions that contribute to the celebration of Corpus Cristi in Valencia. The first is more lively and features folk dancing, pipers and costumed giants, while the second is a more solemn affair thanks to the Biblical scenes that are portrayed on traditional floats. There’s also mystery plays that are put on around the city streets. Small bonfires and parties spring up on Valencia’s beaches as locals celebrate the Night of the Witches.